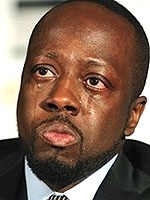 JANUARY 19--During a briefly teary defense of himself yesterday, Wyclef Jean again reminded listeners that he spent a couple of days in Haiti "carrying dead bodies on the street." If anyone had missed his tweets, Jean added, "I was the one carrying little girls to the morgue." The musician also asserted that he had never used any of his charitable foundation's funds for his personal benefit, but declined to entertain questions about the $410,000 that went to him and his cousin/business partner for rent, production services, and the star's appearance at a benefit concert. Jean explained that he was "told not to address" those sticky questions, presumably by spokesman Ken Sunshine, who usually spends his day handling tabloid inquiries about the love lives of clients like Leonardo DiCaprio and Justin Timberlake. 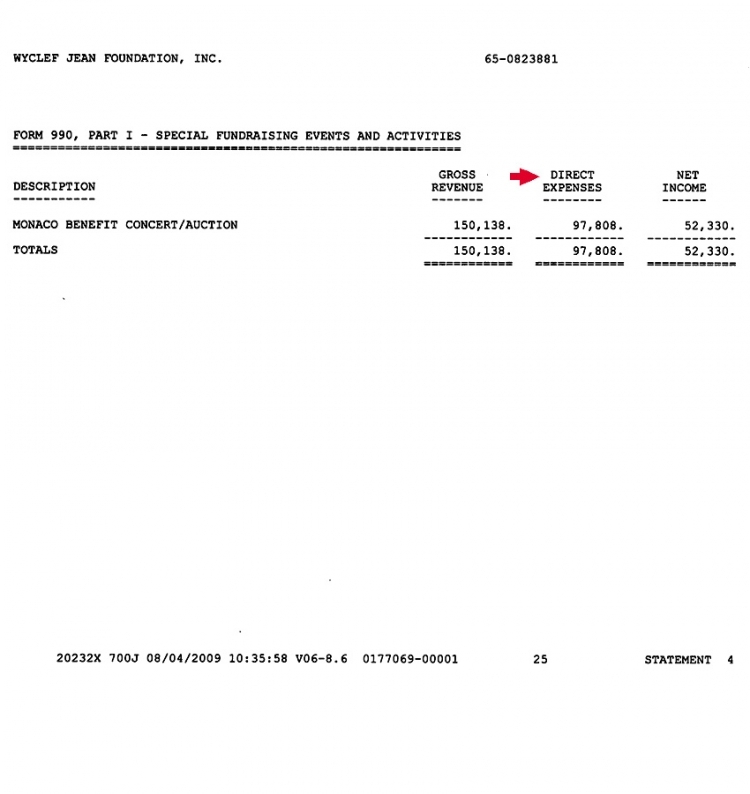 Jean left the task of answering questions about his checkbook to Hugh Locke, a consultant who was identified as president of the Yele Haiti Foundation, which was originally incorporated as the Wyclef Jean Foundation in 1998. Jean had long fled the podium by the time Locke acknowledged that the years-late filing of the group's tax returns was a "mistake." The payment of $100,000 to a firm owned by Jean and relative Jerry Duplessis (for a Jean concert performance) "was not our finest hour," said Locke, who promised that the group would be "more appropriate" in the future. * Locke yesterday claimed that the $100,000 paid to a Jean company for his performance at a fundraiser included expenses associated with that gig (like "background musicians" and "backline" costs). Locke had previously told the Associated Press that Jean had only pocketed $25,000, with the $75,000 balance going to pay for "backup singers." Jean, though, has toured with a single female backup singer, most recently his sister Melky (who founded her own Haiti charity, the Carma Foundation, in January 2008). "I'm not saying he didn't benefit from it," said Locke, who has sought to minimize the singer's windfall. 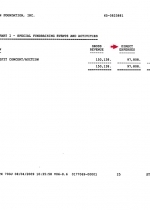 Locke has also avoided mentioning that the foundation's own 2006 IRS return (which was filed 28 months late) includes a separate line item accounting for $97,808 in "direct expenses" associated with that benefit in Monaco. 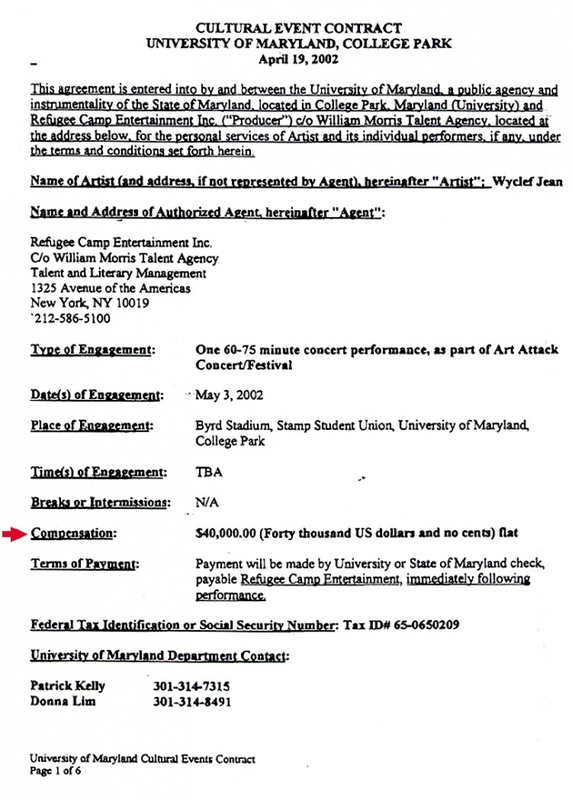 The tax return makes it clear that the $100,000 Jean cleared was specifically paid "for the musical performance service of Wyclef Jean." 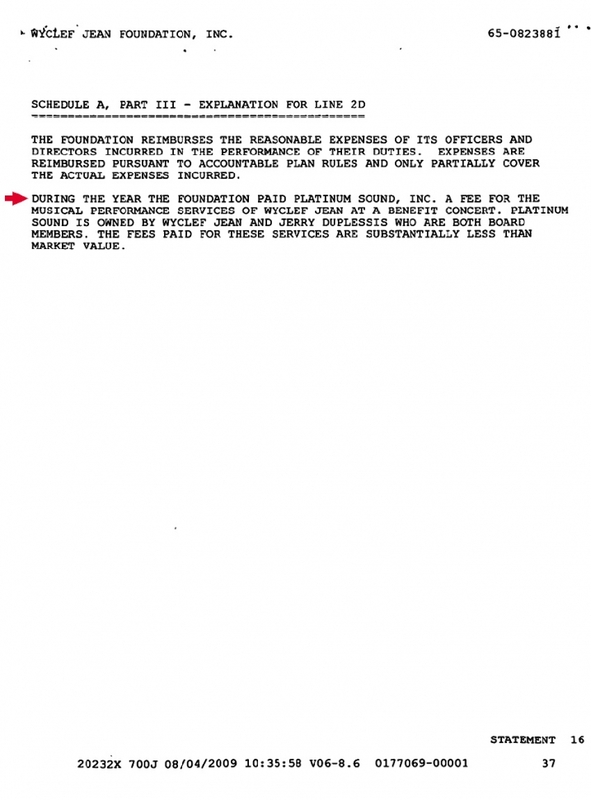 * While the musician chose to bank $100,000 in foundation funds for a single performance, the group's tax return asserts that the fee was "substantially less than market value." This claim--that Jean and his partner provided discounted rates on office space, booking fees, and $250,000 in television production services--is supported by, well, nothing. Ditto Jean's claim that he put $1 million of his own money into the charity. Jean, who noted yesterday that the peak of his career came in 1996 when he was a member of the Fugees, is not a big concert draw. In early-2008, during his 24-date "Carnival House Tour," Jean and his five bandmates played in clubs averaging about 1000 seats, a large dropoff from the days when he played significantly larger venues. 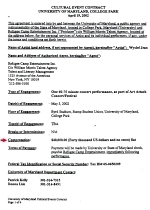 For example, Jean headlined a May 2002 festival at the University of Maryland's 10,000-seat Byrd Stadium. Contract records show that he was paid $40,000 for that show. A few years later--with no new hits under his belt and even more years between his Fugees glory days--Jean was charging his own charity $100,000 for a gig. And that sum was purportedly "substantially less" than his "market value," which presumably would have been in $150,000-$200,000 range (depending, of course, on your definition of "substantially less"). * In light of the assertion by Jean's representatives that the distribution of funds to a foundation's board member was a routine occurrence, TSG conducted a comparison of the business practices of Jean's group with those of 40 not-for-profit groups founded or closely affiliated with celebrities. Like Jean's foundation, each of the 40 groups has filed tax returns detailing their income and expenses, records that are available for examination/downloading on guidestar.org, the leading online clearinghouse for information on non-profit groups. In most cases, the site offers the last three IRS returns filed by an organization. A review of these tax returns shows that not one of the 40 organizations has paid a penny to a celebrity for any service rendered--even at a discounted rate--for the group. This list includes foundations formed by or connected to DiCaprio, Timberlake, Angelina Jolie and Brad Pitt, Will Smith, Bruce Springsteen, Britney Spears, Jay-Z, Madonna, Tiger Woods, Alicia Keys, Derek Jeter, David Letterman, LeBron James, Jay Leno, Michael J. Fox, Barbra Streisand, Bill Gates, Sean "Diddy" Combs, Martin Scorsese, Michael Douglas, Steven Spielberg, Snoop Dogg, Lenny Kravitz, Danny DeVito, Russell Simmons, Dave Matthews, Richard Gere, Ron Howard, Edward Norton, Jane Fonda, Stevie Nicks, Sharon Stone, Kirk Douglas, Bruce Willis, Peyton Manning, Kelsey Grammer, David Geffen, Gloria Estefan, Stephen King, and Tom Brokaw. Locke did not return TSG messages left on his voicemail. Several of Jean's celebrity peers listed above will be appearing with him on Friday's "Hope for Haiti" telethon, so perhaps they can share tips on how to run a charitable foundation without dipping into the till.